Independent living communities. These retirement communities often resemble any other apartment complex or subdivision—but there’s usually a minimum age limit. They provide the maximum amount of independence possible for residents, with individual housing units and basic home services including housekeeping, laundry, and yard work. Most independent living facilities don’t offer personal care or skilled nursing services. Assisted living communities. In these retirement communities, you’ll get a slightly higher level of personal care—with services including meal preparation, dressing and bathing, and help with medications. These communities may resemble independent living communities, with separate homes, condos, or apartments within a compound or complex. Continuing care facilities. These senior living communities offer a wide range of services, allowing seniors to stay in place as their needs change. They offer independent living services, assisted living for those who need slightly more assistance, and skilled nursing care for those with more serious health issues. Memory care facilities. Some senior living communities offer a special focus on caring for seniors with memory impairments, including Alzheimer’s care. These communities often offer specialized housing options and staff with advanced training in providing medical, social, and psychological care to residents with Alzheimer’s. Home care options. A popular option with seniors who prefer to stay at home, there are plenty of skilled nursing and elder care providers nationwide. Services offered range from light housework and companionship to skilled in-home care from licensed medical staff. On this site, you can search for senior living options nationwide—or right in your neighborhood. 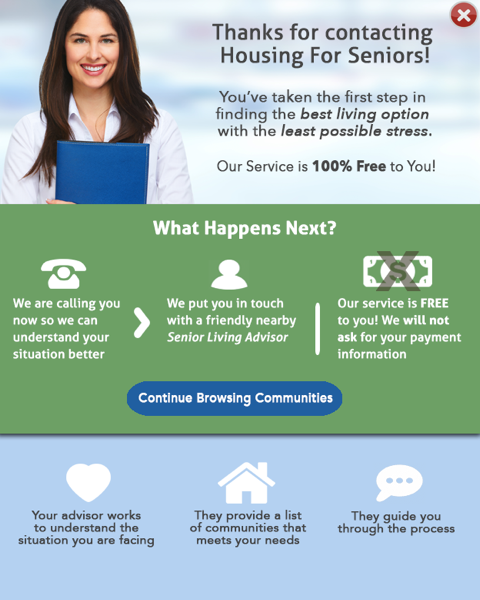 You can also check out our library of senior housing articles or bring your questions to our experts. The perfect retirement community is out there. Let us help you find it.